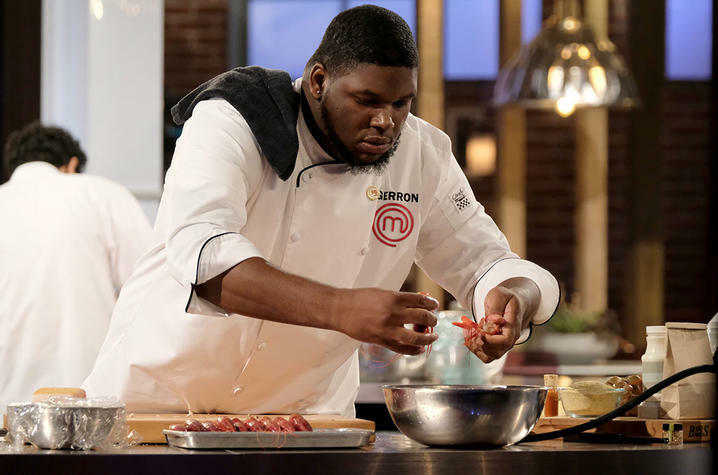 Louisville native Gerron Hurt cooking on Fox's "MasterChef." LEXINGTON, Ky. (Feb. 4, 2019) — The University of Kentucky Martin Luther King Jr. Center has scheduled several events in February especially with Black History Month in mind. Below are the highlights of that schedule. Celebrate Chinese New Year at the Martin Luther King Center (MLK Center). It’s the Year of the Pig, and UK will join 20 percent of the planet’s population (about two billion people) in celebrating the event. Lucky colors to wear this year (especially on the Chinese New Year) are primarily red, gold (or bright yellow) and pink, with blue and green. Lucky foods to eat include dumplings, spring rolls, fish and a jelly rice cake or fruit. And for students: shrimp is said to ensure success in one’s academic studies. Pair the shrimp with veggies, said to enhance one’s intelligence, on Tuesday, Feb. 5. Chef Gerron Hurt, winner of "MasterChef" season nine, will visit UK on Feb. 11. A Louisville native, Hurt is a Western Kentucky University graduate. An underdog from the beginning, Hurt won the coveted MasterChef trophy by defying his mentor-judge’s advice in the finale and cooking from his Southern roots — his grandmother’s recipe for shrimp and grits, to be exact — but with the professional flair and elevated techniques he had learned throughout the competition. Hurt will give a cooking demonstration for students at 3 p.m. Monday, Feb. 11, in the The Food Connection Learning Kitchen (registration required), followed by a free public lecture 5:30 p.m. Monday, in the Multipurpose Room at William T. Young Library. What else is on tap for February? Growth Talk is sponsored by Growth Point Ministries and the Black Voices Gospel Choir at 7:15 p.m. Tuesday, Feb. 12, at the MLK Center. Kenneth Tyler, professor and department chair in the UK College of Education’s Department of Educational, School and Counseling Psychology, will have an address at a Lunch and Learn noon Wednesday, Feb. 13, in the MLK Center. The Buddhist holiday parinirvana of the Buddha Shakyamuni refers to the celebration of the nirvana-after-death 2,600 years ago of a Nepal-Indian prince who became the historical Buddha. UK’s observance is Friday, Feb. 15, at MLK Center. Growth Talk: Ladies Edition, sponsored by Growth Point Ministries and Black Voices Gospel Choir, will be 7:30 p.m. Tuesday, Feb. 19, at MLK Center. Still We Rise Banquet is slated 6 p.m. Thursday, Feb. 21, in the Gatton Student Center Grand Ballroom. Explore Your Heritage Workshop will be 5:30 p.m. Monday, Feb. 25, in Room 108-A of William T. Young Library. Carter G. Woodson Lunch Lecture, co-sponsored by the Center for Equality and Social Justice, is slated noon Wednesday, Feb. 27, at MLK Center. Soup and Substance, co-sponsored by Underground Perspective, Student Activities Board and Student Government, is scheduled 5:30 p.m. Thursday, Feb. 28, in White Hall Classroom Building Room 110.